There are several (six so far) major changes in this update include the additions of Private Missions; Inverted Mission Awards; Mission restrictions by Join date; Network restrictions and a new missions at a glance toolbar. Minor updates in this update includes tighter restrictions on parameters such as Country, network and Interest. Oh, and in case you didn’t notice, the mission comments have been moved down and now appear AFTER the other missions display box. The first major change is the addition of Private Missions. As I understand this feature, this would be a handy way to provide targeted missions for your followers of a particular interest. You will need to manually enter every ticker that you want to allow for each private mission. 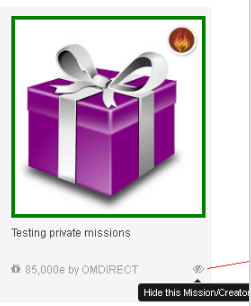 When creating a new mission - at the very top – the drop down box is where to select for Private mission. Note the two warnings – You can not change this value after setting it AND fixed eaves rewards do not work with Private Missions – only scaled rewards will work. The next box will be where you enter ALL of the tickers that you want to predefine for the private mission (you will have to repeat this for every private mission). Make sure you enter the tickers EXACTLY as shown! Each ticker has to separated by a comma with no spaces. 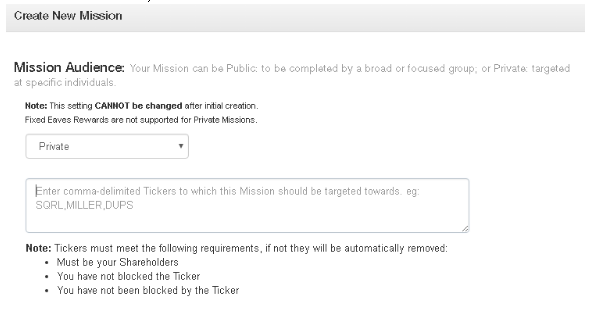 In the above example, only tickers SQRL,MILLER,DUPS will be able to complete this private mission. Note: The system will automatically flush out any invalid or ineligible tickers – and most times without telling you there’s an invalid ticker. Don’t forget… Private missions are SCALED REWARDS only. Inverted Mission Awards Nifty feature that will allow you to invert the scaled awards, so that newer players will get higher mission rewards. So far, I’ve only used this with EK scores but I’m told it will work with other networks as well. Mission restrictions by Join Date Another feature to target newer players. With this one option box, You can restrict your mission to the newest fresh faces. The default is calander year 2010. Remember that the dialog box is year, month and day. Network/Interest restrictions We finally get restrictions! With this feature we can now restrict by connected networks. I’ve only tested the major networks so far – Twitter, Facebook, Xeeme and Youtube. As an example, if a player doesn’t have a valid Twitter account connected to their profile, they can’t complete your Twitter mission. Looks like a great way to cut down on players who hit/run missions. Of course, this option requires that the other players have set their Network/Interests. Update: the interest/networking bug has been fix. its now any interested specified. If you are creating a mission...Remember that you are restricting your mission to that interest - and a player can only have a maximum of six(6) interests specified. Missions at a glance toolbar New toolbar on includes quick-access buttons to display your own missions; only missions you are eligible to complete. Above assumes doable missions. Targeting someone for a private mission should override interest selects. When you click on the “eye” you will get a pop-up box (see below) the left (orange) box will hide that mission and the red (right side) button will cause ALL missions from that player to be hidden from your mission display. On the very lower left is the option to view/edit all hidden missions. I'm sure there are many more features yet to be discovered, so I will be updating this blog as we uncover more features - both documented and undocumented :) Feel free to leave informative comments/feedback in the comments below or contact me on the EK website.